NEWPORT – Both boys basketball teams showed why they could be tough to deal with in the 9th Region Tournament. The Newport Central Catholic Thoroughbreds used their size and depth to dominate teams all season and that didn’t change Friday. They won their sixth consecutive 36th District championship, 65-36 over the rival Highlands Bluebirds on The Hill. NEWPORT – The games in this rivalry are always physical. That’s especially the case near the rim. The winner of the annual 36th District girls basketball title game between the Newport Central Catholic Thoroughbreds and Highlands Ladybirds fought through the contact and finished better near the hoop. G. Michael Graham Photos. Above: Highlands guard Brendan Buten puts up a shot against Newport in Wednesday's 36th District Semifinals. Bottom: Newport Central Catholic post Jake Schulte gets in solid defensive postion against Bellevue. The Bluebirds and Thoroughbreds meet for the district title on Friday at 7 p.m. at NewCath. For the visitors, playing in this game and another is a major accomplishment in the rebuilding process. On the other side, the hosts came into the season huge favorites to six-peat as district champions and contend for a 9th Region title. The reason is their depth and size. G. Michael Graham Photos. The Highlands Ladybirds (top) and Newport Central Catholic Thoroughbreds (bottom) will play for the 36th District championship on Thursday at 7 p.m. Highlands won it last year. They are both not only going to the 9th Region Tournament. The Highlands Ladybird and Newport Central Catholic Thoroughbred girls basketball teams are also both considered contenders to advance to Bowling Green. They are ranked in the top three in the region by many publications. G. Michael Graham Photos. Top: Highlands post Parker Harris (10) battles Newport's Kameron Covington for the opening tip in the Bluebirds' 75-64 win on Wednesday. Bottom: Newport Central Catholic's Drew McDonald scores near the rim in the Thoroughbreds' 71-24 victory over Bellevue. The teams will play for the 36th District championship on Friday at 7 p.m.
NEWPORT – Toward the end of the second game of the tournament doubleheader, the respective student sections began the, “We got sprit” chants among others at each other. G. Michael Graham Photos. Above: Highlands' Izzy Schultz (13) sets up for a free throw in the second half of Tuesday's 36th District semifinal win over Dayton. Bottom: Newport Central Catholic senior Nikki Kiernan (24) contests a shot by Newport's Kylie Orr (23). Kiernan had seven blocks and 14 points in the Thoroughbred win. Highlands and NewCath face off for the district title on Thursday at 7 p.m. on The Hill. NEWPORT – They may have entered the 36th Girls Basketball District Tournament eagerly anticipating a rematch with each other. But the first order of business for the Highlands Ladybirds and host Newport Central Catholic Thoroughbreds was to take care of their semifinal opponents and nab a spot in next week’s 9th Region Tournament at the Bank of Kentucky Center. That did not turn out to be a problem as the Highlands cruised past the Dayton Lady Devils, 70-27 and NewCath ran away from the Newport Lady Wildcats, 63-39 on Tuesday. High school football teams normally do not have to find new opponents in the second year of two-year contracts. 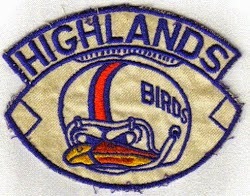 The Highlands Bluebirds had to find a fill-in opponent in 2012 after Dixie Heights dropped the second year of a two-year contract. But the Bluebirds found a game with Scott County. G. Michael Graham Photo. Highlands senior Tomi Blanton (12) guards Simon Kenton's Abby Owings (11) in Friday's regular-season finale. Blanton scored nine points in the 55-41 Lady Pioneer win. INDEPENDENCE – The Highlands Ladybirds basketball team knows where it stands with the state’s elite. The Highlands Bluebirds basketball team finished the regular season with some momentum. The Newport Central Catholic Thoroughbreds basketball team has a ton of momentum entering the postseason. The Thoroughbreds (26-3) concluded the regular season with a bang taking out the Conner Cougars, 73-54. NewCath has won 19 in a row. G. Michael Graham Photo. Highlands quarterback Drew Houliston (10) recently announced his intent to play football at Division III Wittenberg University. Houliston is one of eight Highlands seniors committed to playing college football. Exactly one-fourth of this past season’s seniors will be taking their talents to the next level. The Highlands Bluebirds basketball team snapped a two-game losing streak with a home win Wednesday. The win over Covington Holmes on Friday loomed large in terms of the 9th Region. The Highlands Ladybirds basketball team earned its 20th win of the year on the road Monday. The Ladybirds faced the Bracken County Lady Bears (14-6) and pulled off a 51-40 win in a make-up contest. They are 20-5 with their sixth straight win. G. Michael Graham. Newport Central Catholic forward Jake Schulte looks for a teammate in Friday's win over Covington Holmes. Schulte had eight points, 18 rebounds and four blocked shots in the win. HIGHLAND HEIGHTS – The same strategy that’s helped them all season helped again in another big game. The Newport Central Catholic Thoroughbreds like to find the hot hands and use their versatility to overwhelm opponents. It helped them to a crucial 72-57 9th Region win over the Covington Holmes Bulldogs on Friday. The bad weather continued Friday leading to more cancelled games for the Highlands basketball teams. The battle of 9th Region contenders turned out a sloppy performance Thursday on the Hill. Contributed Photo. Kelsa Mueller Ader, a 2007 Highlands graduate, will be running in the Flying Pig Marathon in May hoping to raise money for Breast Cancer research. Kelsa Mueller Ader ran with competitiveness and intensity in track and cross country at Highlands. But on May 4 of this year, the 2007 Highlands alum will be running for a bigger cause. That’s running in the Flying Pig Marathon across the river in Cincinnati for the Breast Cancer Research Foundation. Ader hopes to raise $10,000 in the 26-mile, 385-yard race. The Highlands Ladybirds basketball team it is hitting postseason form with a big win Tuesday. Highlands ventured to Alexandria and beat the Bishop Brossart Lady Mustangs, 51-45. Highlands (19-5) has won five in a row and has come a long way since losing to Brossart, 51-36 in the Conner State Farm Classic on Dec. 27. The next step toward respectability for them was to beat a team that made the 9th Region Tournament last year. The Highlands Bluebirds girls basketball team may have to win games like this to advance in the postseason. Highlands moved to 17-5 overall and 3-2 in games decided by five points or less with a 41-40 win over the host Beechwood Lady Tigers (10-10) on Friday. Highlands moved to 11-2 against 9th Region competition with the win. Once again, frigid weather postponed many basketball games in northern Kentucky. The Newport Central Catholic girls (19-3) were to play host to Walton-Verona. It marked the third cancellation in the last couple weeks for the Thoroughbreds. They play a make-up game at Ryle on Feb. 19. Mother nature has been rough to the Highlands boys basketball team this winter. G. Michael Graham Photo. Highlands sophomore Brianna Adler makes a move in Monday's game at Scott. The Bluebirds downed the Lady Eagles, 56-47 to move to 16-5 on the season with the win. TAYLOR MILL – They struggled to make plays down the stretch going 2-2 last week. But that was not the case Monday. The Highlands Bluebirds girls basketball team outscored the Scott Lady Eagles, 21-13 in the fourth quarter to pull away for a 56-47 victory. FRANKFORT – They did it last year and hoped to laugh in the face of the challenge again. That was not a problem. For the second straight year, the Newport Central Catholic Thoroughbreds boys basketball team (21-3) won five games in six days to win the All “A” State championship. They took down the Cordia Lions (17-6), 72-61 on Sunday at the Frankfort Convention Center. NewCath has won 13 in a row. The Highland Bluebirds boys basketball team has its first two-game winning streak of the season. G. Michael Graham Photo. Newport Central Catholic sophomore Ben Weyer (middle) races upcourt after a steal in Saturday's All "A" State semifinal win. The Thoroughbreds battle the Cordia Lions for the crown at 2:30 p.m. Sunday. FRANKFORT – You can patiently run your offense for even a couple minutes against them and still not get a good look. The Lexington Christian Academy Eagles (14-8) were the latest to find out about the size and length of the Newport Central Catholic Thoroughbreds boys basketball team (20-3). NewCath used that and its usual focus and determination to beat Lexington Christian, 78-49 in the All “A” State Semifinals on Saturday at the Frankfort Convention Center. G. Michael Graham Photo. Newport Central Catholic senior Nikki Kiernan takes the pass and scores a fast-break lay-up in Saturday's All "A" Semifinal loss to Danville. Kiernan scored 16 and grabbed 17 rebounds for a double-double. FRANKFORT – It did not look good at halftime. The Newport Central Catholic Thoroughbreds trailed the upstart Danville Lady Admirals, 34-24 at that point of the All “A” State Semifinals despite a size advantage because of a bad second quarter. The fears came to fruition as Danville (13-4) pulled a second straight upset, 71-55 Saturday at the Frankfort Convention Center. Experience helped out in this situation. The Newport Central Catholic Thoroughbreds girls basketball team led by just five points in the fourth quarter against the Trimble County Lady Raiders. But NewCath pulled away for a 65-48 All “A” State Tournament quarterfinal win Friday. The game took place at the Frankfort Convention Center.